Choo Choo, Ohh Yeah... Located in the heart of Katanga Canyon this powered coaster is perfect for the whole family. Fast enough to thrill younger riders, and exciting enough for the older guests, it is the perfect all round family coaster. Designed by John Wardley, the coaster takes young and old alike twisting and turning through the landscape, narrowly avoiding beams and climaxing at speed through a tunnel shared with the nearby Congo River Rapids. 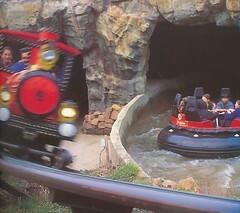 First opened in 1992, the Runaway Mine Train debuted with the brand new themed area Katanga Canyon. "Now its finished, ride it - the new Runaway Mine Train at Alton Towers" was the message that was piped through television adverts the country over, signalling that the park's latest attraction was ready for guests to enjoy. In June 2006 the ride suffered considerable damage in an incident where the train split and the front section rolled back into the rest of the cars. Thankfully, no guests were seriously hurt, but the ride was closed for the remainder of the season until repairs were made. The ride reopened on April 6th 2007, but even then the back cars were missing and the train not back to full length until June 2007. It is now back in action though, and today remains as the oldest coaster in the park. 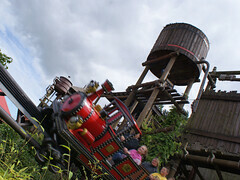 Despite this, it is one of the most enduringly popular rides; especially amongst the younger guests!